Mirian Raas and her faithful crew make their living salvaging lost treasures from sunken ships along the coast of tropical Sargava. While retrieving riches from the bottom of Desperation Bay, Mirian and her friend Jekka, one of the last of his lizardfolk tribe, unexpectedly run across the wreck of an ancient magical ship. The discovery leads them on a quest for an arcane artifact called a dragon’s tear, which may be the key to locating Jekka’s vanished people. But a vengeful sorcerer and a zealous agent of the Child-God Walkena also seek the dragon’s tear—and they’ll stop at nothing to get it. Can Mirian and her crew pass through the legendary gate in the sea and find the tear before it’s too late? From critically acclaimed author Howard Andrew Jones comes a tale of clashing cultures and jungle adventure, set in the award-winning world of the Pathfinder Roleplaying Game. A solid sequel to Beyond the Pool of Stars. Similar to Stalking the Beast, which was itself a sequel to Plague of Shadows, we once again have a maturing and sympathetic portrayal of the main heroine's main companion. In the first 2 books it was the wonderful half-orc Drelm, and in these latest 2 books, it's the lizardman Jekka. I still prefer Elyana, Drelm et al. to Mirian Raas, Jekka et al. If I had to guess, though, future PF novels by HAJ will bring entirely new characters and locales, so there's that to look forward to. I liked the competing...villainous might not be the right word...interests and foils to the party, but it felt like the agent of the Child-God Walkena was a bit underutilized to be honest. On the other hand, the "vengeful sorcerer" (no spoilers) from the back cover was delightful. Her banter w/ a certain wordsmith in 1 scene was great. Wow- One of the best Pathfinder Tales novels yet. 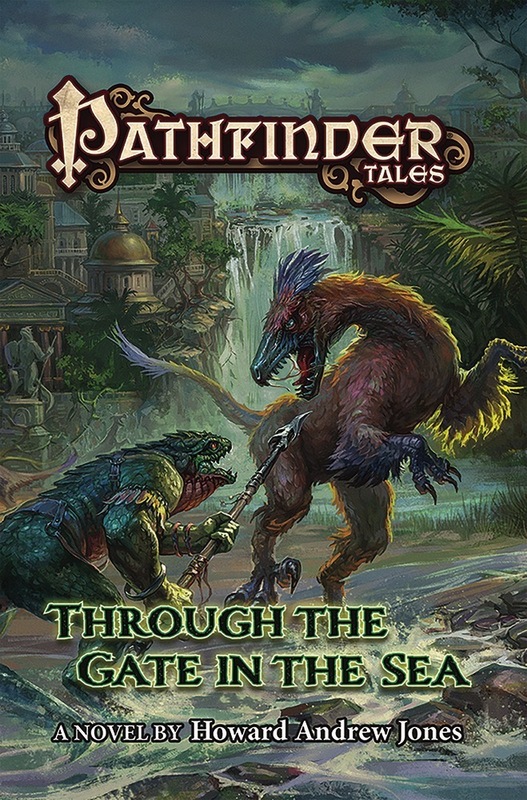 I have recently read a copy of the Pathfinder tales “Through the Gate in the Sea”. Let me first start by saying the book is excellent. Rarely have I read a novel that beckons to me as Gm to sit down later and take some notes to “borrow” later for my Pathfinder RPG game. I am personally running a Serpents Skull campaign which happens to take place near the region that a portion of the book takes place (smugglers shiv and surrounding sea). Where to start? The novel continues the adventures of Mirian Raas (a human female captain of a sea vessel) and her loyal friend Jekka. Now in case you have not read any of the other Pathfinder tales involving this duo Jekka is a male lizardfolk. The author gives us great insights into the relationship between the two but the most enjoyable moments for me is when we see the way Jekka interacts with other People. So often when we read we think of ourselves in the character’s shoes. When we see things from a Lizardfolk’s perspective it can be amusing, confusing yet oddly it reminds us that in the world of fantasy Humans are just a one of the many races. It makes me really wish to explore playing a Lizardfolk character who also searches for his lost heritage (or perhaps others of his kind). As for adventure This book has plenty. You go from aboard ships, to the depths of the ocean. There are pirates, sorcerers, Dinosaurs and did I mention followers of the Child-God Walkena. And of course, for my fellow Pathfinder or D&D Gm’s we can’t forget to mention cool locations. The heroes adventure ancient vaults of long forgotten crypt and then a magical island. They search for a magical artifact and of course a Party of opposite intentions wishes to find the same artifact for much less than noble reasons. I love a book that will challenge my inner creativity and in that regard this book is one of my favorites. I love a great adventure, but throw in the clash of differing cultures and rare locations and it makes a great story. I have included a link to my video review of the Novel also if you wish to see the extended review. Go to Video review here.. Ruins and pirates and dinosaurs, oh my! Journey to Sargava, where pirates are rampant, ruins need exploring, and colonialism is very much a current issue! Another rousing tale of adventure staring Mirian and Jekka, further exploring the past of the Sargava region, and the themes of immigration and displacement. A must read. Announced for February 2017! Cover is mostly final, but may be subject to change as the release date approaches. Hurray! Another Mirian Raas novel! As nice as Mirian Raas is as a heroine I hope we'll get some new heros / heroines who aren't rogues or swashbucklers soon. Lizard: Give me your feathers! Feathered Lizard: No! They're mine! When will this book show up on the Pathfinder Tales subscription page? The book after it is already displayed. Has this book been delayed? This should be out tomorrow. 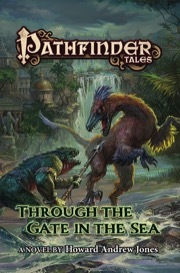 It looks like there will be no audiobooks of the Pathfinder Tales being offered in the immediate future. From what i heard, the line is not selling that well anymore. April´s "Gears of Faith" could be the last one for all i know. I don't get time to read dead tree very much at all anymore, so despite getting my subs, I have also been getting the audiobooks and reading them that way (haven't even opened a PFTales hard copy for over a year now). No more Audiobooks basically means no more reading PFTales for me (or at least maybe one or two a year at most). There hasnt been any official news on this line for a while. It seems there might be some broader issues across all of paizo's lines in the next few months (my guess would be starfinder did more damage to staff availability than anticipated). Although no news isnt good - there hasnt been any bad news either (yet). While nothing official has been announced, neither amazon, audible or macmillan/tor books have listed any pre-orders beyond april. And they are likely not affected by Starfinder at all. I also know that at least one Pathfinder Tale by a new writer (from his twitter account) has been finished for a while, so the possibility of sales not being good enough is strong. James Sutter is the head honcho of both. I agree it doesn't look like the line is doing well, but I think it's important to distinguish speculation from announced policy. It's possible Tor are disappointed with the sales and want to reduce the rate of output, it's even possible there's not going to be any more novels...However, it's also possible Sutter said "Yeah, I can manage Starfinder on top of my other duties"and then discovered that was too much and the line hit a hurdle six months later after the books he was editor for pre-starfinder were released. While I don't think it is all doom and gloom for the PF Tales line...I hope it is not. The silence coming out of Pazio on it is a little worrying. I mean people have been asking about it for a couple of weeks now in multiple threads. What!?! No this will not do. I very much hope that the Tales line is not suffering. Maybe it just isn't doing as well as TOR had hoped? "1. Is the Pathfinder Tales line cancelled, on hiatus or just not updated anymore? I'm asking because there is nothing pre-order-able beyond april on Amazon, Audible, Paizo or Tor books. Also the actual february book and the one coming out in april have no audible version available (which may be normal, i don't know about that). "It's not cancelled as far as I know... but I'm not the one to ask about details on that line. That's more of an Erik question." So, it seems that James Sutter is (momentarily?) not responsible for the books line (because he develops Starfinder) and Erik Mona has taken over. Erik is already very busy at the moment with the "Pathfinder Roleplaying Game" line (the hardcovers) the Comics line (which he writes atm) and the "Pathfinder Battles" miniatures line (which he took a little step back from and now let´s Michael Kenway write the blog). So the most logical explaination may be, that it takes some time to make the transition and we´ll hear something soon. None the less, i have become a little wary of the influence that Starfinder is taking on Pathfinder. After a three months hiatus of the Pathfinder Campaign Setting line (which is a serious loss to me), this is the second serious impact i notice. And while there is no gap yet, the non-existent information is not somewhat bothering. I´ll have to add, that this book will only be available on march 1st 2017 according to amazon. It may be, that that is the date the audible version becomes available. Any ideas yet on when this will become available as an Audiobook??? Neither this, nor Gears of Faith is available yet, and this one was released in dead tree 2 months ago, with still no hint of an Audiobook on Audible. Starting to get a little annoyed at a lack of news about the line queries that were expressed a few months ago now. Yes, neither Paizo nor Tor Books can comment on the Pathfinder Tales line atm (due to legal reasons), but they are working something out. The line is NOT cancelled. Personally i hope we hear something in may, as the next book would come out in june (if the old schedule is being kept). grrr... Stupidest idea ever to swap to TOR. We lost eBooks and the books all no longer line up evenly on the shelf. Now on top of that, we've lost Audiobooks, which is currently the only way I am able to "read" them, and has been since they first became available. If the next book is due out in July rather than June, that could explain the display glitch for upcoming subscription shipments. Maybe they are holding back the July display because they expect to have the next novel in that slot shortly? It could have been all manner of things - it doesn't have to have mean the line is in "drastic" trouble (at least from a commercial perspective - opinions on ebook availability, the change in hardcover format and so forth is obviously an aesthetic matter for each of us). I note that the fiction has recently disappeared from the APs (something which always seemed a 'non-negotiable' to me in prior discussions with staff and especially Erik Mona). If I were to have a stab, I'd guess that TOR have an 'exclusive' right to distribute hardcopy fiction set in the world of Golarion and there was a contractual sticking point given such has been appearing as the backmatter of the AP. Perhaps Tor wanted to wait until it had ceased before progressing with the discussions. Tor books is no longer publishing the Pathfinder Tales. Paizo is looking for a new publisher. It's not really on the gears of faith product page that's just a link. This is the thread where James Sutter provides the latest information.